1889: Mr Elmer was elected to represent Elmswell on the committee of Woolpit Fire Brigade. First Fire Station was in the yard behind The Fox. 1926: presentation by Greene King of Shand Mason steam-driven pump (third-hand – it was used in Colchester for many years). Present fire station built in 1957. 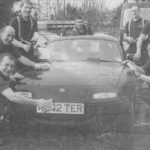 Article by Graham Saward in “Firefighting in Suffolk”. 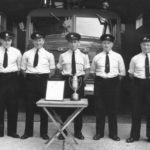 George Russell: In 1926, Greene King the Bury brewers were updating their fire engines; Elmswell was presented with their old vertical steam-driven fire engine. Before this the village had to rely on a horse-drawn manual pump from Woolpit. The presentation was on a Saturday afternoon and there was a display of the engine by the Brewery Brigade. The engine was then housed at The Fox and drawn by Bert Miller’s lorry. 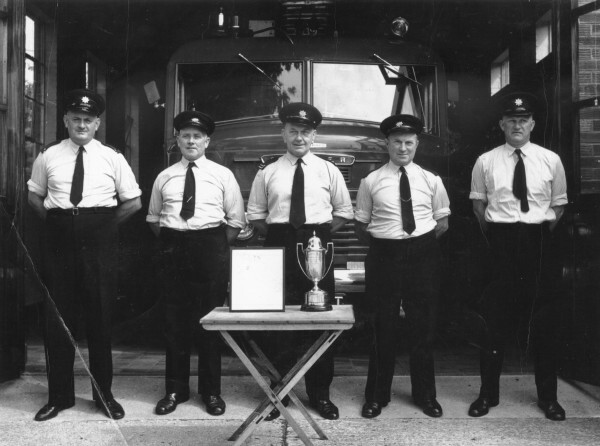 The Elmswell Brigade Captain was Harry Baker, the engine driver was Bill Jacob. 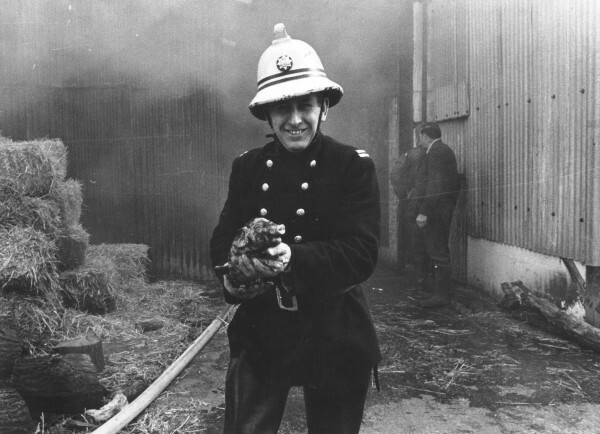 One fire I remember them attending was in Hawk End Lane at a pair of thatched cottages (Nos. 19 & 20) occupied by the Farrow and Armstrong families. 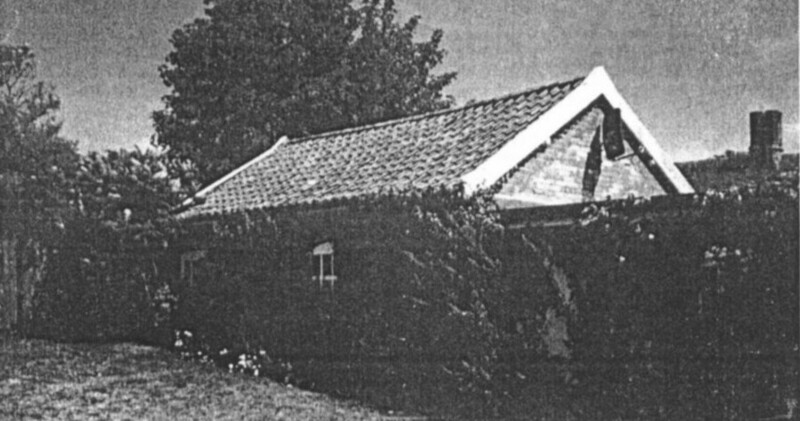 They were thatched and Jim (Buck) Armstrong, a farm worker, lived there; Fred Farrow owned the cottages and lived at 20. He worked at the Bacon Factory. In about 1930 the houses caught fire, probably caused by sparks from a passing steam train. The engine stood in Mulley’s Meadow where there was a large pond; the water was pumped from the pond to a large tank half way down Hawk End lane and then by Woolpit’s manual pump to the fire. 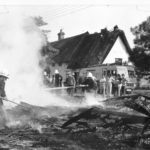 Although the Elmswell Steam Powered Fire Engine and the Woolpit Manual pump were on hand to pump water from New Road to a tank near 28/29, the houses were destroyed. They were replaced by a bungalow and Fred Farrow lived in it. 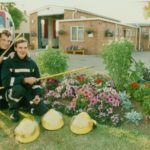 Dot & John Redit: The fire station was further down the same drive (as the Albatross), past the shop; Jim Baker kept pigs round there too. Frank (Redit) slept there 3 nights a week 10-6am – the girls manned the telephone during the day; men telephonists came to do night shift 10pm-6. Fred and Cicely Buckle: [Cicely] was a telephonist at Fire Service, 6 of us, from 7 to 10 in the evenings, as well as working at the bacon factory in the daytime – it was a hut beside the PO, but finished up round the back of the Albatross garage, by where fire engine was parked. Elmswell had a fire service long before the war because the GK brewery donated a big steam pump engine. 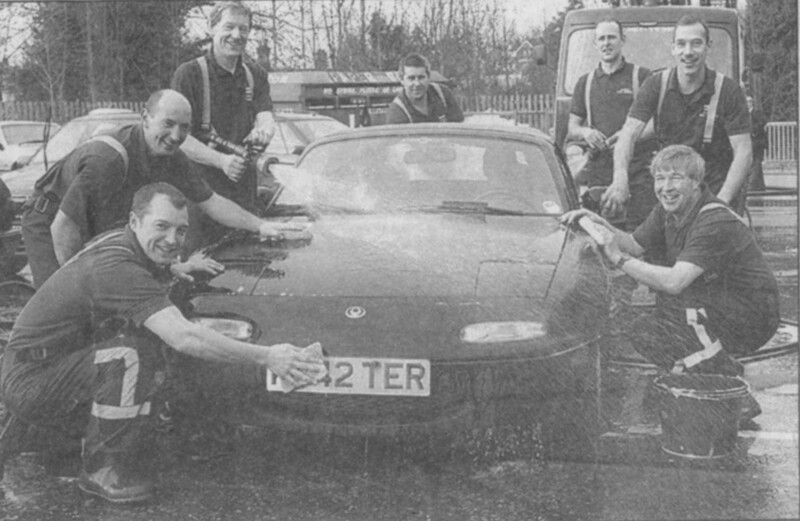 It was parked in the Fox yard, a big copper boiler on the back, 4 rubber-tyred wheels. If there was a fire, factory hooter would sound once for in-village, twice for out-of-village; Mr Miller (who had a carrier business down Rose lane)would nip along with his lorry and hitch up. Old Bill Jacobs fron the garage, or ? Baker, lit the ready-made fire while the others were arriving, and it picked up steam while they were going to the fire with Bill Jacobs hanging on the back stoking up. For those days it was not a bad fire engine. 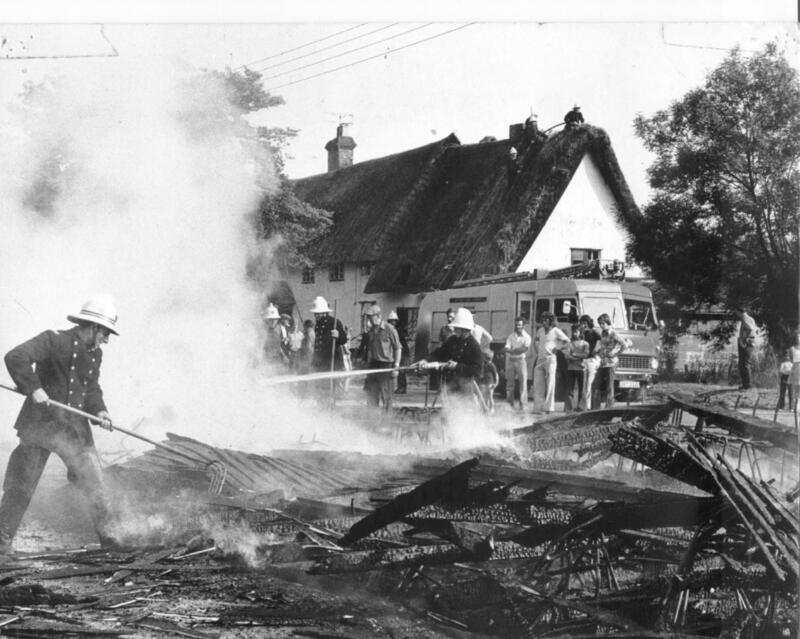 Coming home from school one day, Dedgy Farrow’s bungalow (not quite the far end of Hawk End Lane) was alight; the fire engine was getting water from the pond in the Glades (then just a field) and pumping it all the way up to Hawk End Lane, where Woolpit had their engine (a hand pump, 4 men on each side). 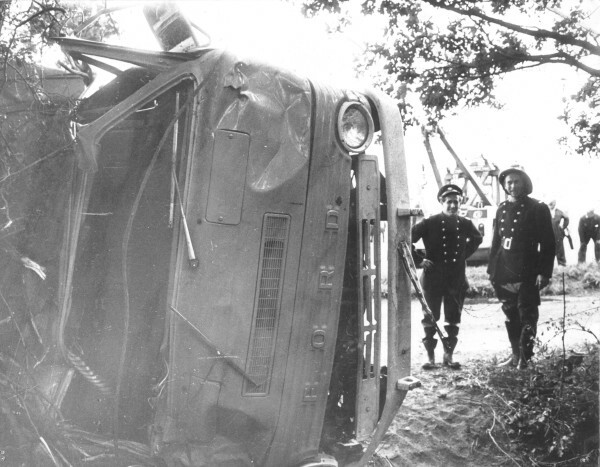 Fred joined the Fire Service just after the coastal floods (1953), and served for 24 years; he knew Frank Redit of course. They had house bells, which made a hell of a racket. In the daytime the siren would go as well as the house-bells, but after 10pm just the bells. A PO engineer would come and check them from time to time (they didn’t have a phone). But he had to retire at 55. Jill Jacob: Dad was in the Fire service. He was part-time, paid quarterly, so the income paid the electric bill. Fire alarms in the night: the bell used to go off by the side of the bed; the Fire Station was near the railway crossing, on the PO side of the road. 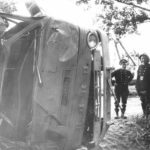 The following article was included in Graham Saward’s excellent book “Firefighting in Suffolk – an Illustrated History” (Vol.1 – pre-1948), published in 1966. Attempts to contact Mr Saward for permission to reproduce it have so far failed, but perhaps he/his family would not mind…. The village or township of Elmswell must have counted itself to have fallen on a lucky day when, not long since, it became known to the public that without any case of reservation of any kind they had, following a simple application, been adjudged of as meriting the gift of a Shand Mason steam fire engine, such as many a town a dozen times the size of Elmswell retains for service, and is proud to possess. This was following the appearance of an advertisement in the ‘Bury Post’ which indicated that Messrs. Greene, King and Sons, Brewers of Bury St. Edmund’s, having provided themselves with a motor fire engine, were prepared to make a gift of their Westgate Fire Brigade steam engine to the village near Bury St. Edmund’s most in need of such a means of dealing with fire. Elmswell had been adjudged to merit the gift and, naturally, its arrival at Elmswell has been looked forward to with some interest. The occasion was Saturday afternoon, 14th February 1926, the engine, spick and span, was in the yard of the ‘Fox’ Hotel, within view of the railway station, pending the finding of a permanent fire station, and the Westgate Fire Brigade, under Superintendent Parmenter, came over from Bury St. Edmund’s with their new motor to felicitate the Elmswell people on their acquisition. Thinking that they ought to have better protection against fire, they bought the steam engine which was now being presented to Elmswell from the Colchester Corporation in 1921, after it had been working in Colchester for a great many years. 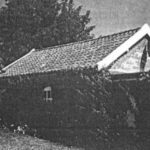 They had it completely overhauled by Shand Mason & Co., who, in handing it over to them, said that it was then as good as new. 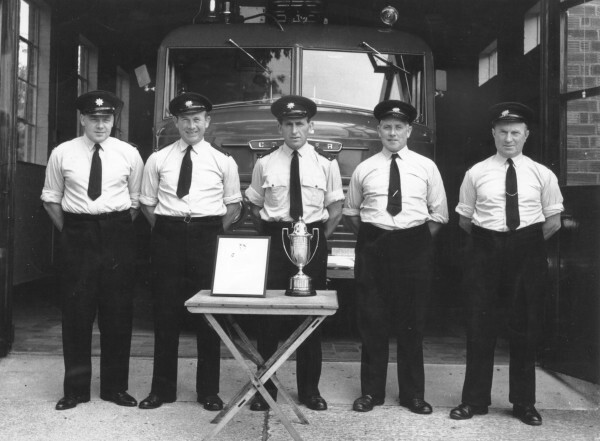 A few months ago, when on a visit to Messrs. Dennis of Guildford, for the purpose of buying lorries, he was asked if he had seen the latest invention in fire engines, and was shown the fire engine, which they saw before them, and which did exactly the same work as the big fire engine which they were now presenting to the parish. 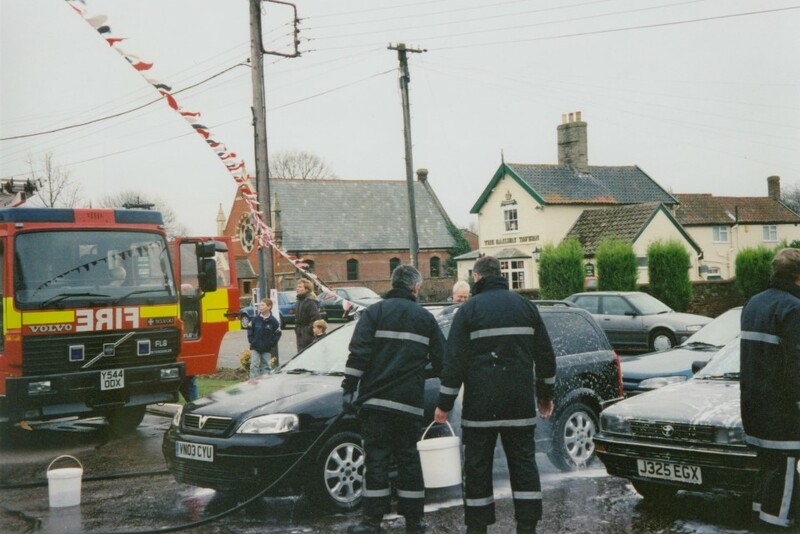 It was worked with an ordinary petrol engine and they could see how extremely mobile it was, which was so very necessary. He went on to say that the engine which the village were receiving was a very good one. Since their new purchase it had been standing by and it at last occurred to his directors that it was not a great deal of use to them. They thought it might be an advantage if they presented it to one of the villages in the neighbourhood, who could make better use of it, and advertised in the newspapers for applicants. 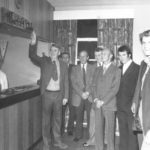 They had several applications from villages, and found it a difficult task to decide who should have it; they ultimately came to the conclusion that Elmswell, where there was a factory, was probably the most important and go-ahead place. They hoped that Elmswell would make good use of it, although they hoped that there would not be many fires. 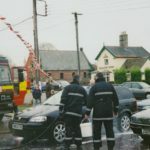 The possession of a fire engine was the greatest insurance possible against fire. 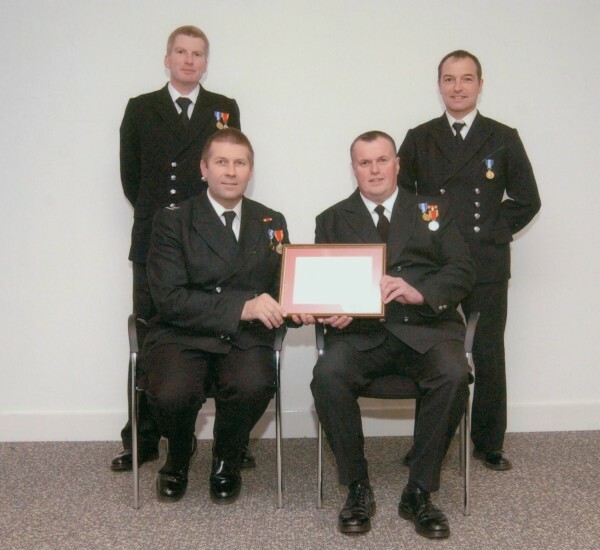 It was seldom that their brigade was called out and he trusted that it would be the same at Elmswell. 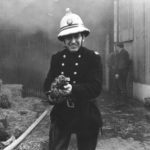 The protection against fire was much greater now than it used to be. There was not so much wooden building going on and consequently fires were not so frequent. He understood that the Parish Council was taking charge of the brigade, and he hoped that it would not only be used for Elmswell, but for the surrounding villages. He was sure Supt. Parmenter and the officers of the firm’s brigade would render any service they could in connection with starting the Elmswell Brigade. Mr. Lake then formally presented the engine to the Chairman of the Parish Council Mr. H. Frost. Mr. Frost, on behalf of the parishioners, thanked Mr. Lake very much for the magnificent engine. He was sure that the directors of Messrs. Greene, King and Sons in deciding to make the gift to Elmswell, made no mistake, (laughter) He expressed the assurance that the Brigade would carry out its work in the same spirit that prompted Messrs. Greene King and Sons in making the gift. 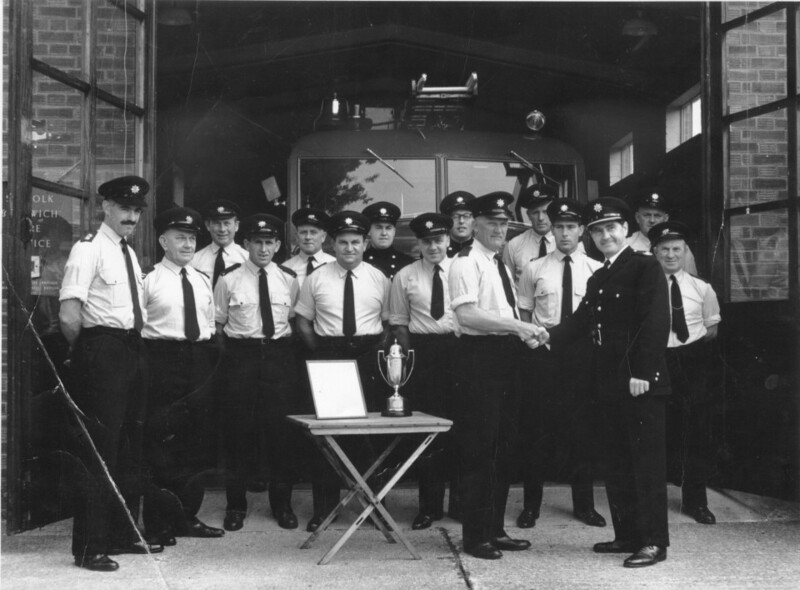 Messrs Greene, King and Sons fire brigade afterwards gave a fine pumping display from a pond in a meadow lent by Mr. H. E. Mulley, with their 13 h.p. Dennis trailer petrol pump. Fourteen names have already been sent in as candidates for the Elmswell brigade. 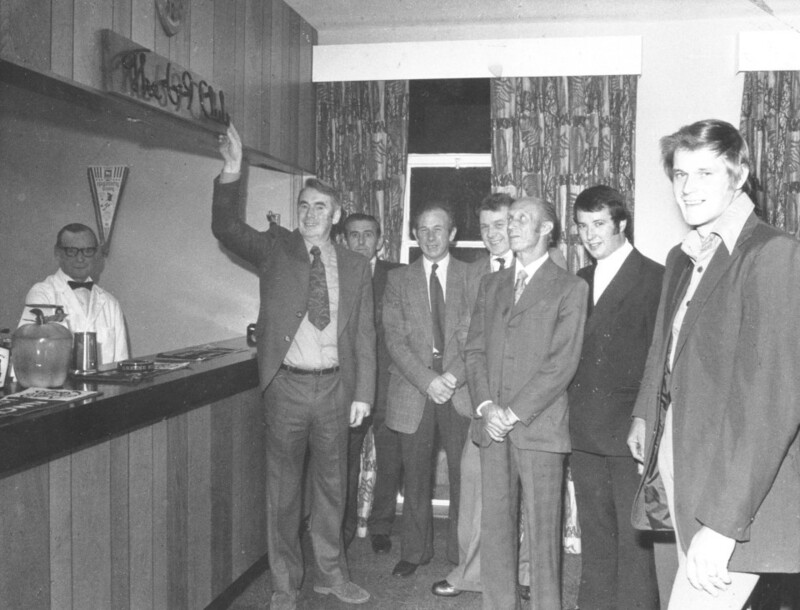 After the display the members of the Westgate Brewery Fire Brigade were entertained to tea at the Fox Hotel at which the Rev. J. D. Sayer, Mr. H. G. Frost Chairman of the Council, and Mr. W. S. Aldus (clerk) were present. 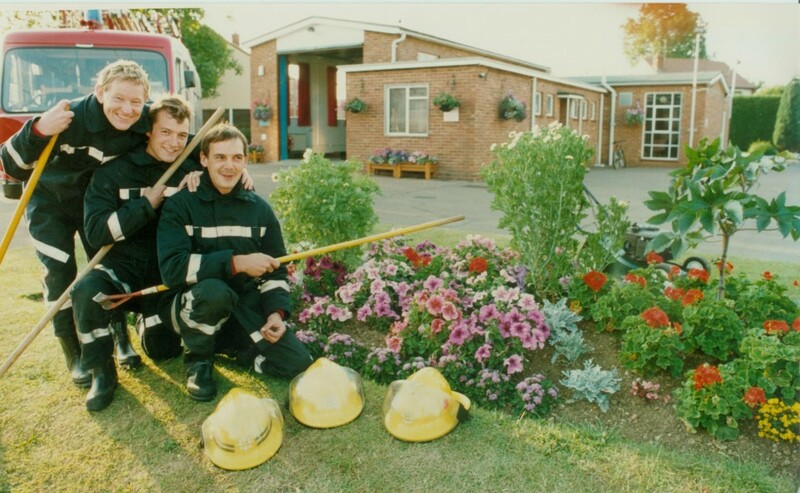 The building at the rear of The Fox Public House, which was the first fire station in Elmswell is still in use today, as a store. The engine was later re-located at Crown Mill, in the Old Mill Yard. The Parish Council provided second hand ex-London uniforms and brass helmets and the steamer was eventually converted to be towed by Bert Miller’s lorry. 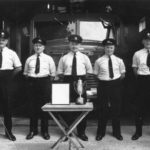 In 1938 the brigade was taken over by Gipping Rural District Council and the steamer was withdrawn from service and replaced with an open bodied motor fire tender, with a Merryweather pump. 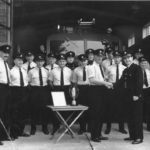 In order to accommodate the new vehicle the fire station was moved to the Albatross Garage and during the war years to a nissen hut nearby, which served until the building of the present fire station in 1957.